Looking for movie tickets? Enter your location to see which movie theaters are playing Blessed Is the Match: The Life and Death of Hannah Senesh near you. 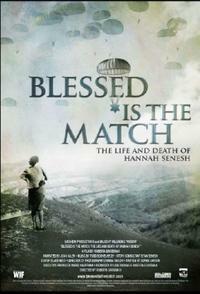 Blessed is the Match is the first documentary feature about Hannah Senesh, the World War II-era poet and diarist who became a paratrooper, resistance fighter and modern-day Joan of Arc. Safe in Palestine in 1944, she joined a mission to rescue Jews in her native Hungary. Shockingly, it was the only outside rescue mission for Jews during the Holocaust. Hannah parachuted behind enemy lines, was captured, tortured and ultimately executed by the Nazis. Her mother Catherine witnessed the entire ordeal – first as a prisoner with Hannah and later as her advocate, braving the bombed-out streets of Budapest in a desperate attempt to save Hannah. With unprecedented access to the Senesh family archive, this powerful story unfolds through the writings and photographs of Hannah and Catherine Senesh.